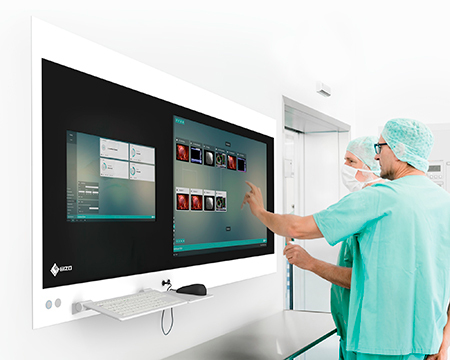 Karlsruhe, Germany, October 13, 2016 – EIZO GmbH announces new standard models within its portfolio of CuratOR Surgical Panels. The existing selection of models is now expanded to include additional monitor sizes, touchscreen models, and a large screen with up to 8 megapixel resolution. There is a wide range of freely configurable variants in addition to what is offered with the standard models. This means that the number and size of the monitors, the material and color, integrated accessories, interfaces, as well as PC and IT components can be selected and integrated according to customer wishes or the requirements of the operating room. In addition, EIZO's software for OR integration, CuratOR Caliop, can best be operated using the Surgical Panels. EIZO GmbH is based in Karlsruhe, Germany and is a leading manufacturer of visual display solutions for medical imaging applications. The branch office of EIZO GmbH in Plauen, Germany is solely dedicated to the development, production, and sales of OR solutions. The company's portfolio includes color and gray-scale monitors from 1 to 8 megapixels, image management systems, and accessories as well as individual products and complete solutions for the OR. EIZO GmbH is a subsidiary of EIZO Corporation, a global leader in the manufacture of high-end visual display solutions for medical and graphic applications, air traffic control, and other markets.